You'll be £12.99 closer to your next £10.00 credit when you purchase Fishing Industry. What's this? Working with prestigious archives of contemporary photographs, the authors chart the history of Britain's fishing heritage with 120 rarely seen photographs. Fishermen were hardy individuals with a precarious existence dictated by the changing rhythm of the wind and the waves. While at sea, their womenfolk cleaned, salted, pressed and bulked the fish. The fishermen of the East Coast are the last of the hunter gathers, in the later 19th and early 20th century British fishery expanded and exceeded its European rivals to become the biggest fishery in the world. Dwindling fish stocks after the Second World War saw the end of the fishing industry as it had been known, now the trawlers had to make the hazardous voyage to deeper waters. 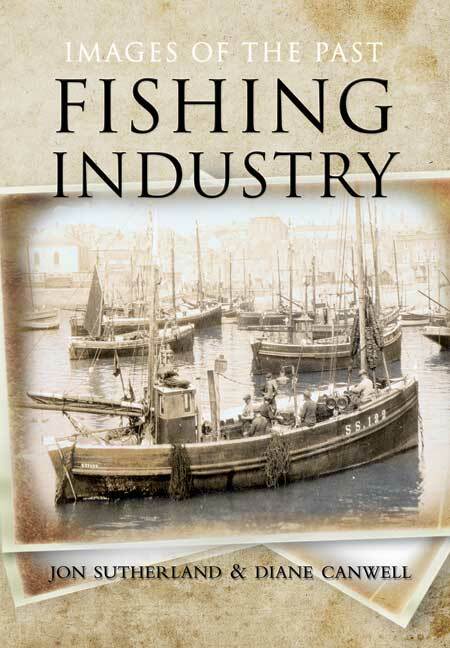 This book celebrates the heyday of the British fishing industry, the people, the processes and the vessels. Jon Sutherland and Diane Canwell have written over 200 books, their titles winning awards such as New York Libraries Best of Reference, Booklists Editor's Choice and the Portsmouth Book Award. As East Anglians, their roots are firmly in Britain's farming and fishing heritage, both with strong family ties to these two most traditional industries. The authors have written a wide range of titles including social and military histories, they have worked closely with archives and museums in selecting photographs for these two new titles. This brilliant collection of 120 high quality photographs, fortunately, records the industry’s heyday. Joined together b simple clear text it provides a first class record of a once important industry. The people, the boats, their equipment, the markets, the towns everything is memorably and very atmospherically described. Apart from maritime historians and fishermen, anthropologists and archaeologists will find this book of great value.